Located in the heart of Northern California, Sacramento is known for its hot summer climate. Because having a reliable air conditioner is an essential part of living in California during the summer months, you will want to hire a central air conditioning contractor you can trust to install and maintain your unit. We’re even available for 24/7 emergency AC repairs. *Not valid on diagnostic or tune-up fee. 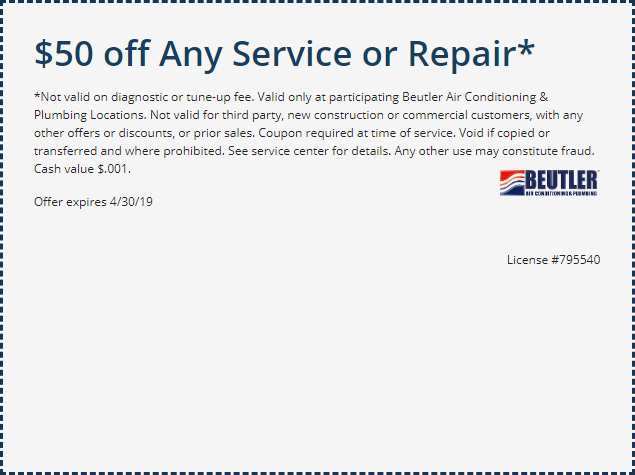 Valid only at participating Beutler Air Conditioning & Plumbing Locations. Not valid for third party, new construction or commercial customers, with any other offers or discounts, or prior sales. Coupon required at time of service. Void if copied or transferred and where prohibited. See service center for details. Any other use may constitute fraud. Cash value $.001. Our air conditioning repair Modesto technicians can diagnose and address any problem your system might be having as quickly as possible. With years of experience in home air conditioning repair, we have the tools and the knowledge to repair your air conditioning system quickly and effectively. We will do our best to minimize any inconveniences to you or your family. If we find AC repair is not the best or most efficient solution for your AC system, we can help install a new air conditioning system, you’ll need to know which air conditioner you should choose. There are a lot of different products on the market today, each with their own features and capabilities. At Beutler SM Air Conditioning and Plumbing, we are here to help you find the right system for your home and your budget. To request more information, please contact us at 916-646-2222 to request more information.